I’m still figuring out an intelligent way of graphing this data over time. 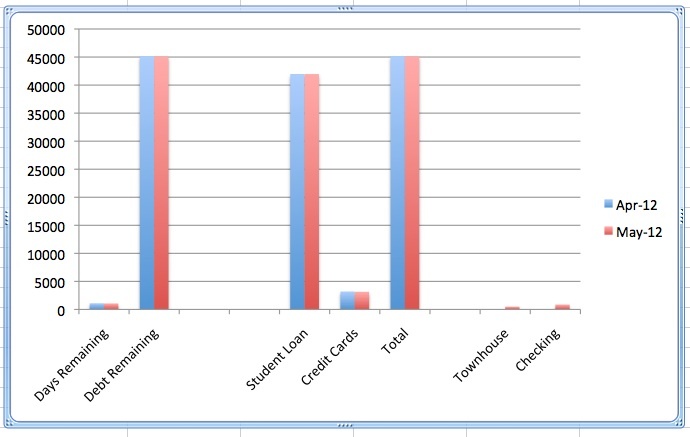 Right now I have a clunky graph from Microsoft Excel. My overall debt is 45099.65 right now, but I have 500 set aside for the townhouse and will be adding 500 a week for the rest of the month. That will eat up a huge chunk of the money I would have otherwise applied to my credit card. Some more observations I have made about behavior… I tend to want to spend money on items I feel I deserve as soon as I get money. Staying in line with goals can be a real challenge. I want to see that graph get lower over time. Actual spending in all different categories has been lower than I would’ve expected other than $85 spent (somewhat foolishly) on fixing the cable from my battery to the subwoofer. Spent only $113 on gas for the month and most of my dining out expenses were paid for. Cinco de Mayo was great. Had a $19 dinner, then drinks at a local bar with a $10 cover. Drinks were around 5 and change, I bought one and a friend bought the other. Was worth it to get out of the house. I discovered I’m uptight sack of social anxiety if I don’t drink at least a little. I’ve never really liked crowds of people. Part of being an INFP I suppose. It’s really insightful to see how spending can vary between social circles. Paying $1000/mo to lease an expensive SUV and $200 for prime tickets at a car race. Even if I made double my income I wouldn’t do either. I was raised to get as much value as possible from my dollars. Others seem to be more concerned with image or having the absolute best experience possible regardless of the cost. Started watching a show on Bravo called Million Dollar Listing – New York. Type A personalities selling Real Estate. All the glamor, the charm, the competitiveness. I see common themes where all of the agents have families with a lot of money and of course the heavily inflated prices for real estate in Manhattan. It’s very entertaining to watch at the least. The first month wasn’t easy and this second one won’t be much easier. Brown bagging it each day or going home on my lunch break until I have the $2000 deposited into my partner’s acct for closing. This experience is making me a stronger person for sure. Off to bed now… Another update soon. Dude, I watched Million Dollar lListings for the first time on Sunday and was shocked…homeboy randomly walks into a shoestore and drops $1k on two pairs of slippers. WHAT!!!!!!!!!!!!!!!!!!!!!!!!!!!!!!!!!!!!!!!!!!!!!!!!!!!!! It’s a riot man. He’s the son of this guy (http://en.wikipedia.org/wiki/Howard_Lorber). It’s eye-opening to see what people just blow money on without thinking twice about it. I suppose it’s all relative though. If I had a mil or 2, 1k is just like an average joe paying $30.